(Hong Kong, 11 October 2018) Ka Shui Group has devoted great efforts to apply “Industry 4.0” elements to our company’s development: production equipment enhancement and staff training, thanks to the guidance of German professionals in Industry 4.0 and Hong Kong Productivity Council (“HKPC”).We successfully manage our production through real-time data and apply Industry 4.0 standards to our daily production.On 11th October 2018, Ka Shui Group, the first enterprise in Hong Kong to obtain this recognition, was officially awarded Industry 4.0 "1i Maturity Level Recognition" Certificate by HKPC and Fraunhofer IPT. We will continue to apply Industry 4.0 to further enhance our productivity and efficiency in responding to our customers’ needs. 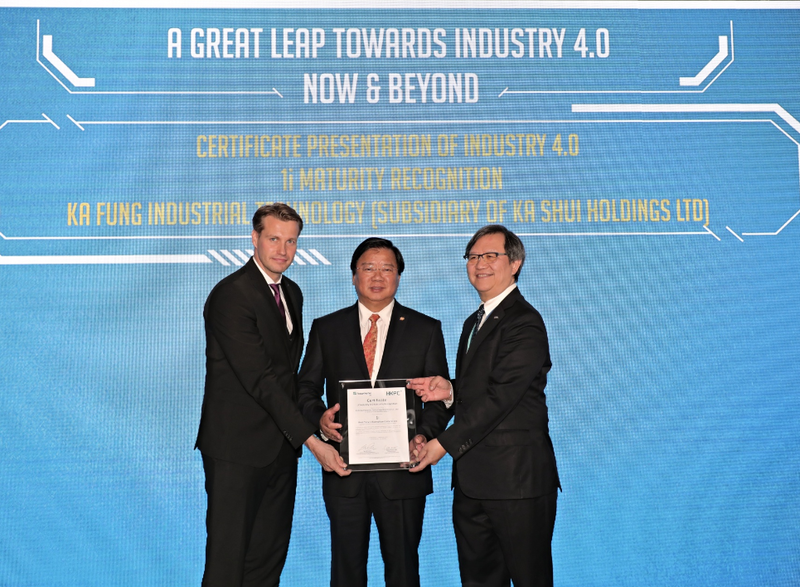 Mr. Lee Yuen-fat, Chairman of Ka Shui Group, was presented the Industry 4.0 "1i Maturity Level Recognition" Certificate by Mr. Willy Lin, Chairman of HKPC (right), and Mr Toni Drescher, Head of Technology Management of Fraunhofer IPT (left). In the same event, Mr. Lee Yuen Fat, Chairman of Ka Shui Group, representing Hong Kong Federation of Innovative Technologies and Manufacturing Industries, and other 13 leading industry chambers and professional organizations joined together to sign the "Reindustrialization and Industry 4.0" Charter with a view to fostering reindustrialization and transformation to i4.0 for companies in Hong Kong and the Greater Bay Area. Mrs. Carrie Lam, Chief Executive of the HKSAR (the eighth one from left), and Mr. Nicholas Yang, Secretary for Innovation and Technology of the HKSAR (the eighth one from right) attended the event to show their support.